Born in Italy in 1975, Camilla Bellone obtained a Master in Pharmacy from the University of Milano. In 2002 she joined the laboratory of Christian Lüscher at the University of Geneva where she specialized in synaptic mechanisms underlying drug addiction. After obtaining her PhD from the University of Milano in 2006, Camilla then moved to San Francisco for a postdoc in the laboratory of Prof. Roger Nicoll at the University of California, San Francisco (UCSF). She moved back to Switzerland in 2008 as a senior postdoc in the laboratory of Prof. Christian Lüscher at the University of Geneva and in January 2011, she received the Ambizione grant from the Swiss National Science Foundation to become junior investigator affiliated to his laboratory. 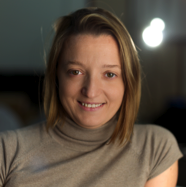 In May 2014 she was awarded the position of assistant professor from the Swiss National Science Foundation at the University of Lausanne and in May 2016 she became Assistant professor at the Department of Basic Neurosciences where she is currently leading her independent research group. The interest of my research is in understanding the mechanisms underlying the postnatal maturation of the mesocorticolimbic system. In particular in mouse animal model, combining electrophysiological techniques with molecular approaches and behavioral paradigms, in my laboratory we investigate how the reward system during the postnatal development encodes experience and how defect in these processes may lead to neurodevelopmental disorders such as Autism Spectrum Disorders (ASDs) or Schizophrenia.